20 Bay: Discounts $500 for 2018 and 2019 Models. 20 Bay with Camo: Discounts $500 for 2018 and 2019 Models. 22 Bay: Discounts $750 for 2019 Models. 22 Bay with Camo: Discounts $750 for 2019 Models. 18 Catfish: Discounts $350 for 2018 and 2019 Models. 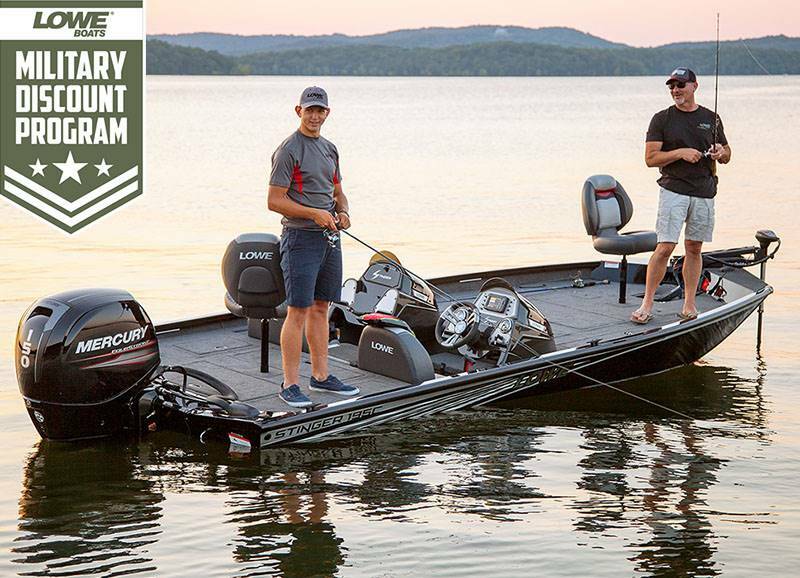 18 Catfish with Camo: Discounts $350 for 2018 and 2019 Models. 20 Catfish: Discounts $500 for 2018 and 2019 Models. 20 Catfish with Camo: Discounts $500 for 2018 and 2019 Models. FM 160 T: Discounts $150 for 2018 and 2019 Models. FM 160 S: Discounts $150 for 2018 and 2019 Models. FM 160 Pro: Discounts $250 for 2018 Models. FM 165 PC: Discounts $350 for 2018 Models. FM 1610 Tiller: Discounts $350 for 2018 Models. FM 165 SC: Discounts $350 for 2018 and 2019 Models. FM 165 WT: Discounts $350 for 2018 and 2019 Models. FM 1625 SC: Discounts $250 for 2019 Models. FM 1625 WT: Discounts $250 for 2019 Models. FM 1710 SC: Discounts $450 for 2018 Models. FM 1710 WT: Discounts $450 for 2018 Models. FM 1800 SC: Discounts $450 for 2019 Models. FM 1800 WT: Discounts $450 for 2019 Models. FM 1810 WT: Discounts $500 for 2018 Models. FM 1900: Discounts $500 for 2019 Models. FS 1610: Discounts $350 for 2018 Models. FS 1700: Discounts $350 for 2019 Models. FS 1710: Discounts $450 for 2018 Models. FS 1800: Discounts $450 for 2019 Models. FS 1810: Discounts $500 for 2018 Models. FS 1900: Discounts $500 for 2019 Models. Skorpion 16: Discounts $150 for 2018 and 2019 Models. Skorpion 17: Discounts $200 for 2019 Models. Stryker SS: Discounts $150 for 2018 and 2019 Models. Stryker 16: Discounts $150 for 2018 and 2019 Models. Stryker 17: Discounts $200 for 2018 and 2019 Models. ST 175: Discounts $350 for 2018 and 2019 Models. ST 175 Poly Camo: Discounts $350 for 2018 and 2019 Models. ST 178: Discounts $350 for 2018 and 2019 Models. ST 188: Discounts $500 for 2018 and 2019 Models. ST 188 DC: Discounts $500 for 2018 and 2019 Models. ST 198: Discounts $500 for 2018 and 2019 Models. ST 198 DC: Discounts $500 for 2018 and 2019 Models. ST 195: Discounts $500 for 2018 and 2019 Models. ST 195 Poly Camo: Discounts $500 for 2018 and 2019 Models. Roughneck 1546: Discounts $50 for 2018 and 2019 Models. Roughneck 1655 BR: Discounts $100 for 2018 and 2019 Models. Roughneck 1660: Discounts $100 for 2018 and 2019 Models. Roughneck 1600 Deluxe Tiller: Discounts $100 for 2018 and 2019 Models. Roughneck 1660 SC: Discounts $100 for 2018 and 2019 Models. Roughneck 1660 Pathfinder: Discounts $100 for 2018 and 2019 Models. Roughneck 1755 BR: Discounts $150 for 2018 and 2019 Models. Roughneck 1760: Discounts $150 for 2018 and 2019 Models. Roughneck 1760 CC: Discounts $150 for 2018 and 2019 Models. Roughneck 1760 Deluxe Tiller: Discounts $150 for 2018 and 2019 Models. Roughneck 1760 Pathfinder: Discounts $150 for 2018 and 2019 Models. Roughneck 1760 SC: Discounts $150 for 2018 and 2019 Models. Roughneck 1860: Discounts $200 for 2018 and 2019 Models. Roughneck 1860 Archer: Discounts $200 for 2018 and 2019 Models. Roughneck 1860 BR: Discounts $200 for 2018 and 2019 Models. Roughneck 1860 CC: Discounts $250 for 2018 and 2019 Models. Roughneck 1860 Deluxe Tiller: Discounts $200 for 2018 and 2019 Models. Roughneck 1860 Pathfinder: Discounts $200 for 2018 and 2019 Models. Roughneck 1860 SC: Discounts $200 for 2018 and 2019 Models. Roughneck 1860 Tunnel Jet: Discounts $250 for 2018 and 2019 Models. Roughneck 1860 Waterfowl Tiller: Discounts $200 for 2018 and 2019 Models. Roughneck 1860 Waterfowl: Discounts $200 for 2018 and 2019 Models. Roughneck 2070: Discounts $300 for 2018 and 2019 Models. Roughneck 2070 Archer: Discounts $300 for 2018 and 2019 Models. Roughneck 2070 BR: Discounts $300 for 2018 and 2019 Models. Roughneck 2070 CC: Discounts $350 for 2018 and 2019 Models. Roughneck 2070 Deluxe Tiller: Discounts $300 for 2018 and 2019 Models. Roughneck 2070 SC: Discounts $300 for 2018 and 2019 Models. Roughneck 2070 Waterfowl Tiller: Discounts $300 for 2018 and 2019 Models. Roughneck 2070 Waterfowl: Discounts $300 for 2018 and 2019 Models. UV 1668: Discounts $50 for 2018 and 2019 Models. UV 1668 WT: Discounts $100 for 2018 and 2019 Models. L 1648: Discounts $50 for 2018 and 2019 Models. L 1648 M: Discounts $50 for 2018 and 2019 Models. L 1648 M Aura: Discounts $50 for 2018 and 2019 Models. L 1648 MT Aura: Discounts $50 for 2018 and 2019 Models. L 1648 MT: Discounts $50 for 2018 and 2019 Models. L 1648T: Discounts $50 for 2018 and 2019 Models. L 1652 MT: Discounts $100 for 2018 and 2019 Models. L 1852 MT: Discounts $100 for 2018 and 2019 Models. L 1852 Aura: Discounts $100 for 2018 and 2019 Models. SS 190: Discounts $250 for 2018 and 2019 Models. SS 210: Discounts $500 for 2018 and 2019 Models. SS 210 RFL: Discounts $500 for 2018 and 2019 Models. SS 210 Walk Thru: Discounts $500 for 2018 and 2019 Models. SS 230: Discounts $500 for 2018 and 2019 Models. SS 230 CL: Discounts $500 for 2019 Models. SS 230 Walk Thru: Discounts $500 for 2018 and 2019 Models. SS 250: Discounts $500 for 2018 and 2019 Models. SS 250 Walk Thru: Discounts $500 for 2018 and 2019 Models. SS 250 Extended WT: Discounts $500 for 2018 and 2019 Models. SS 270 Extended WT: Discounts $500 for 2018 and 2019 Models. SF 194: Discounts $250 for 2018 and 2019 Models. SF 212: Discounts $500 for 2018 and 2019 Models. SF 212 Walk Thru: Discounts $500 for 2018 and 2019 Models. SF 214: Discounts $500 for 2018 and 2019 Models. SF 232: Discounts $500 for 2018 and 2019 Models. SF 234: Discounts $500 for 2018 and 2019 Models. SD224: Discounts $750 for 2018 and 2019 Models. Retreat 230 WT: Discounts $850 for 2018 and $900 for 2019 Models. Retreat 230 RFL: Discounts $900 for 2019 Models. Retreat 250 WT: Discounts $900 for 2018 and 2019 Models. Retreat 250 RFL: Discounts $900 for 2019 Models. Retreat 270 Extended WT: Discounts $900 for 2019 Models. Infinity 230 WT: Discounts $1,000 for 2018 Models. Infinity 250 RFL: Discounts $1,000 for 2018 Models. Infinity 250 CL: Discounts $1,000 for 2018 Models. Infinity 270 RFL: Discounts $1,250 for 2018 Models. Infinity 270 CL: Discounts $1,250 for 2018 Models. Ultra 160 Cruise: Discounts $150 for 2018 and 2019 Models. Ultra 162 Fish & Cruise: Discounts $150 for 2018 and 2019 Models. Ultra 180 Cruise: Discounts $175 for 2018 and 2019 Models. Ultra 182 Fish & Cruise: Discounts $175 for 2018 and 2019 Models. Ultra 200 Cruise: Discounts $200 for 2018 and 2019 Models. Ultra 202 Fish & Cruise: Discounts $200 for 2018 and 2019 Models.